For home, auto and marine applications. Copper clad insulated battery clamp. Color-coded jacketed handles, 1 black and 1 red. Less than 5" long. Adhesive backed cloth strips attach to inside of circuit breaker box to label all household circuitry. Book contains two pages, or a total of 90 marker strips. Carded. For battery, battery charger and testing equipment applications. Copper clad clamps. Handle grips are insulated and color-coded for positive (red) and negative (black) identification. Test for presence of voltage in live circuits. Tests AC/DC voltage from 80-250 volts. The neon indicator glows when voltage is present and brightens as voltage increases. Insulated housing and 2 inch test leads. Built in pocket clip. Tests DC motors, switches and outlets. With detailed user instructions. Replacement leads for Gardner Bender meters GMT-12A, GMT-18A. UL recognized. Tough ABS Plastic. Flexible cords for easy use. Includes spring return and lock. Adjustable, hardened spring steel. Strips 10-24 gauge wire. Helps to align multigang installations of 2 gangs or more. Wall plate fits without additional adjustment. Adjusts to any combination of toggle, decorator and duplex. Built-in bulb level. Large, dual, neon indicators acknowledge presence of voltage. Individual indicators for each voltage range assures reliability of testing. Probes snap on bottom of housing for single hand testing of outlets. Insulated leads and housing. Tests from 100 to 300 volt AC/DC. UL Listed. GB Cable Ripper, Premium, 14 - 6 AWG Cable/Wire, 4 in Overall Length, cULus Listed, For Use to Cut Off Cable Jacket Three-way live circuit tester indicates 120, 240 and 277 volt AC. UL Listed. Tests for breaks in non-energized wires or cords. 360 degree visual indication. Durable, heavy-duty tip. Flexible lead with insulated alligator clip. Pocket clip. Operates from 2 AAA batteries (included). 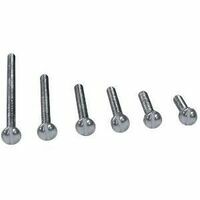 GB Screw Kit, Electrician's, 120 Pieces, Includes: (20) 2/3 in, (20) 7/8 in, (20) 1 in, (20) 1-1/4 in, (20) 1-5/8 in and (20) 2 in Phillips Head Screws, NO 8-32 Phillips Round Head, For Switches, Receptacles and Outlet Applications Shorter for better access to tight spaces between studs and joists, will drill 2' and 4' joists. Self-feeding screw point draws bit through all wood types. Replaces special tools such as right angle drills and eliminates multiple steps to cut the hole to size. Overall length 4.5" (144mm) weight .3 lb. (118g). 1/4" hex. Over center single flute design for cleaner holes and less splintering. Marked with bit diameter and catalog number on shank for easy identification. Not for use in wood with nails. Tapered nose allows cutting in tight locations. Dual cutting edge and high-leverage comfort grip handle design for optimal cutting performance. Precision-machined and induction-hardened knives strengthen cutters and provide consistent performance when cutting aluminum, copper and medium-hard steel wire. Strips cable, 10-22 AWG wire, crimps terminals and cuts bolts. Easy-to-read wire size markings. Economy continuity tester, tests continuity in nonenergized circuits. Features 36" insulated lead with alligator clip end. Fully shielded indicator bulb lights to indicate continuity, Uses 2 AA batteries, not included. Drill/tap high-speed steel bit, split point with web thinning. High quality hex shank to ensure strong connection to drill chuck. Complete hole drilling, tapping and deburring/countersinking in one operation with power drill. Designed to tap up to 10 gauge metal. Back taper or deburr/countersink beyond tap to prevent thread damage from over-drilling. Drill/tap high-speed steel bit, split point with web thinning. High quality hex shank to ensure strong connection to drill chuck. Complete hole drilling, tapping and deburring/countersinking in one operation with power drill. Designed to tap up to 10 gauge metal. Back taper or deburr/countersink beyond tap to prevent thread damage from over-drilling. Smart bulb changers attach to an extension pole and allow the user to remove and replace bulbs quickly and easily, while standing safely on the ground. Suction cups hold bulbs for easy changing. Quick release design breaks the suction on the bulb quickly and easily. Standard 3/4" acme threads to fit most extension poles, pole not included. Made in the USA. Replacement blade for Greenlee 0952-01 or 1940 flexible metal conduit cutter.